Goals like buying a car or travelling abroad are short-term goals whereas purchasing a house or retirement planning are medium and long-term goals, notes Priyadarshini Maji. Arnav Deshmukh, 22, who recently graduated from IIT-Madras and is a scientist with the Indian Space Research Organisation, plans to go on an extended tour of Europe after two years. And while many in his age group might be quite happy to swipe their credit cards or take personal loans to achieve this goal, Deshmukh has started saving 30 per cent of his monthly salary in equity-linked savings schemes (ELSS). The only problem with this plan is the choice of instrument. While ELSS is an excellent tax-saving instrument for long-term saving, it is not the best instrument for meeting short-term goals. Also, ELSS has a lock-in of three years, and each of his instalments will have to be locked in for this period. Deshmukh will need Rs 250,000 to Rs 300,000 for his trip. Mumbai-based financial planner Pankaaj Maalde suggests that Deshmukh should either start a recurring deposit of Rs 8,000 per month or start a systematic investment plan (SIP) of Rs 8,000 in ultra-short term funds. There are many well-intentioned young people who want to take control of their finances at an early age. However, they need to either take good financial advice or be adequately informed about the instruments they invest in. Goals like buying a car or travelling abroad are short-term goals whereas purchasing a house or retirement planning are medium and long-term goals. And to fulfil these goals, different instruments are required. Business development professional Devenish Chopra, 23, has started working recently and wants to buy a car in three or four years. He will need around Rs 800,000 to Rs 900,000 for this goal. He puts aside 20 to 25 per cent of his take-home salary in long-term mutual funds. Says Pradeep Agarwal, CEO, Meri Punji IMF: "To buy a car in the next three or four years around Rs 150,000 should be invested each year in short-term debt funds." He adds that the car should not cost more than 60 per cent of his investments. At the time of purchase, he should compare the loan rates with the returns he is getting on his investments. If the investment returns are better than loan rates, he should consider part-financing the car through a loan. Management consultant Preeti Bhatt from Pune plans to buy a house after five years. The cost of the three-BHK she intends to buy is Rs 5 million at present. She sets aside around 20 per cent of her salary each month in fixed deposits to make the down-payment. She has so far accumulated Rs 300,000. Bhatt should be prepared for the cost of the house to rise to at least Rs 6.5 million in five years. Suppose that she buys a ready to move in apartment. She will have to pay 20 per cent of the cost, or at least Rs 1.5 million as down payment. She can borrow the balance Rs 5 million from a bank. If she takes a loan of Rs 5 million for 20 years and the interest (a guesstimate) is 10 per cent, she will have to pay an EMI of Rs 47,852. She should try to maximise her savings to meet this goal. "From the current take-home salary, deduct the non-discretionary expenses. 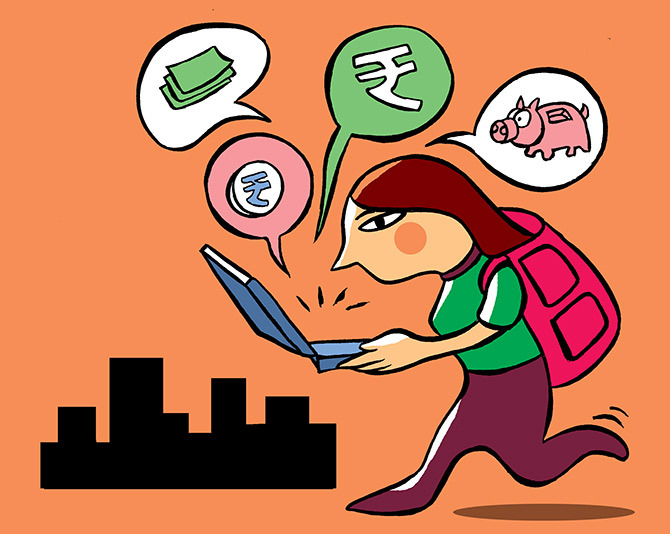 She should aim to save 50 to 60 per cent of the amount that is left," says Deepesh Raghaw, a Sebi-registered investment advisor and PersonalFinancePlan.in founder. The bigger challenge, according to Raghaw, will be whether she will be able to get a loan of Rs 5 million. Generally, banks are reluctant to lend an amount for which the equated monthly instalment is more than 40 per cent of a person's take-home salary. This means that her salary must touch about Rs 120,000 in five years. Of course, if she gets married, she can take a joint loan with her husband, and this will make the task of affording the home loan quite easy. Mumbai-based entrepreneur Bhargavi Vijaykumar's key goal is to retire early. "Any household income that is over and above the average requirement, we split it into two parts. For short-term goals such as to create an emergency corpus or an appliance purchase, we invest in liquid funds. Where the investment horizon is more than two years, we invest in equity mutual funds," says Vijaykumar. This 30-plus professional plans to retire after 20 years. She plans to retire with a corpus of Rs 50 million. Currently, she is putting around 10 per cent of her income into equity mutual funds to meet this goal. Malhar Majumder, founder of Positive vibes consulting and Advisory, says that given her current life stage, Vijaykumar can expect aggressive growth in her family income for the next few years. If her income grows at 7 to 12 per cent, she should be able to meet her goal. Vijaykumar, he suggests, should build a well-diversified portfolio, a process already initiated through regular SIP investments into mutual funds. She can expect a return of 12 to 15 per cent from her equity funds portfolio over the long term. Any annual surplus should also be allocated towards this goal, via SIPs of equity mutual funds.